The Fiat 500s is very popular in the UK, Sadly more and more of these vehicles are getting stolen. 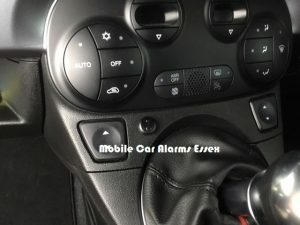 These vehicles are attacked by picking the drivers door lock or by drilling a small hole below the drivers door handle to attack the locking rod. The thieves can enter these vehicles without making a sound. But the good news is our Cobra Can-Bus alarm will improve the security massively on your Fiat 500. This system protects front doors, boot and the interior. If the interior is black like our S model picture above we can professionally colour code the ultrasonic sensors black to match the vehicles a-pillar trims. The Cobra can-Bus system is fully Thatcham approved and it works alongside the original vehicle remote control meaning locking the doors will arm the alarm and unlocking will disarm the alarm. If you would like a Cobra Thatcham Approved Cobra alarm installed in Essex. Call us on 07525 068291.